We are writing to you from the Democratic Federation of Northern Syria, Rojava (Western Kurdistan). Here in the Middle East in the current chaos of social uprisings, struggling regimes, collapsing states, Islamist terror, Fascist expansion and interventions of imperialist forces, in the middle of the Syrian Civil War a democratic peoples revolution is since 2012 officially taking place. The Revolution of Rojava and the political project of the Democratic Federation Northern-Syria are an attempt to protect the peoples of the region, guide a way out of the apparent dead end of never ending crisis, war, destruction and oppression from several sides and builds up peaceful and dignified life for the people and society. With a confederal-democratic self-administration of the peoples of the region, autonomous women‘s organisation in every part of life and a process towards an ecological society the libertarian principles and values of Democratic Confederalism based on diversity and equality get put into practice. The ideology and philosophy of Kurdish leader Abdullah Öcalan are an answer to the social and ethnic questions of the region and give a solution to the cultural and political chaos and threats that come up from the inside as well as are imposed from the outside. His paradigm of an organized society without a state based on basic democracy, the equal representation of all religious and ethnic groups of the region, women‘s equal rights and an ecological responsibility is an alternative to the people outside of repressive nation state regimes, exploitative restructuring from outside for imperialist profits and Islamist terror and oppression. At the very latest since the war of Kobane in 2014 and 2015 the world came to know about the Kurds defeating the Islamist terrorist gangs of ISIS, fighting for their autonomy and democracy. The liberation of Kobane will on 27th/28th January 2019 be 4 years ago. In the meantime the Kurdish YPG and YPJ (People‘s Protection Units and Women‘s protection Units) have liberated big territories from the so called „Islamic State“ and pushed them back until the very south of Syria where right now the offensive for taking also the last areas out of ISIS‘s hands is going on. Wherever the freedom fighters of the YPG/YPJ and their SDF (Syrian Democratic Forces) organized allied forces liberated places from the terrorist rulership of ISIS the revolutionary civil organizations started a democratic upbuilding process together with the local population and gave the people new hope and a way to organize their life collectively, self-determinated and emancipatory. 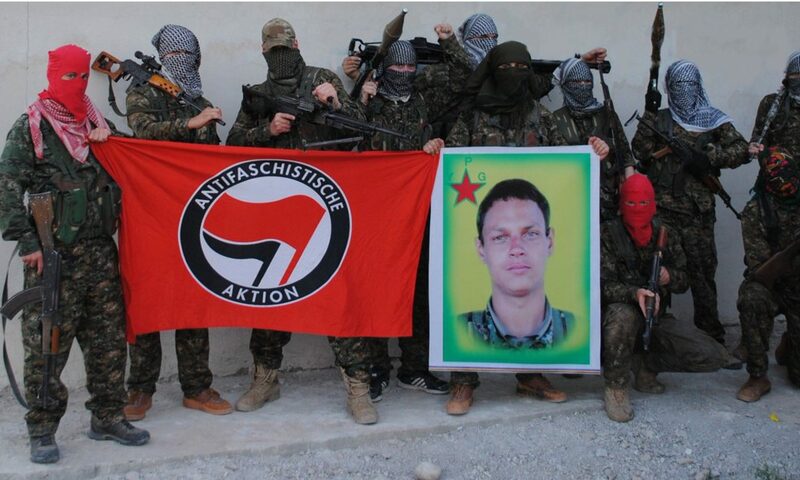 However, with the defeat of ISIS threats towards Rojava from the side of the Fascist Turkish state arised, which is the main enemy of the Kurdish liberation movement since it‘s beginning and the biggest partner and supporter of the Islamist forces in Syria. The invasion and occupation of the Kurdish canton Afrin by the Turkish army and Turkish backed Islamist gangs in the beginning of 2018 was the start of an already long-planed aggressive offensive against the Kurdish revolutionary movement on Northern-Syrian territorry. The silence of the international states was in the face of the occupation and their crimes against the Kurdish population and violations against human rights laws in Afrin a very loud one. Tight economical relations with Turkey, especially weapon deals, made these states supporters and profiteurs of this war. It showed that we can only rely on our own forces and our own strenght. Now nearly one year later we seem again to face an upcoming Turkish attack. The revolution of Rojava has been since it‘s existence a deep thorn in the eye of the Turkish colonialist-fascist government of the AKP-MHP. And islamist leader and dictator Erdogan has made clear a long time ago, that he will not tolerate a Kurdish controlled area next to Turkey‘s border and threatens with an invasion to secure their state‘s „safety interest“. Of course this is not the only purpose. It is more a fundamental contradiction between the Kurdish freedom movement and the Turkish occupation state and the pursuing of the general aim to destroy and extinguish the Kurdish freedom movement and it‘s revolution in Rojava and every other part of Kurdistan. This was yet already a long recognizable developement and since the publication of the United State‘s decision to pull their troops out of Syria the war preparation and propaganda on the side of Turkey has been intensively increasing. The fascist AKP-MHP government takes the withdrawal of the most powerful (but of course only tactical) ally of the Kurds of course as an invitation and a sign to realize their invasion plans right now. The struggle in Kurdistan is an inspiration for revolutionaries all over the world and a hope for the whole suffering humanity. We will be here and defend the revolution with everything that we have. And all who are our comrades and friends we call to rise up for this cause! The threats against the Rojava Revolution must not remain unnoticed! * Let’s come together and protest on the streets to send a clear signal of our solidarity with the revolution in Northeast Syria on 27 January. Let us remember together the resistance and liberation of the city of Kobane. * Let’s use determined and creative actions of civil disobedience to interrupt the production and export of arms, and the daily life of the political parties responsible for the deals with the Turkish regime on 28 January. Let’s make visible the identities of those who benefit from the war, those who finance and drive it. This war will be a very decisive one. For the Kurdish people, for the revolution in Rojava and for all democratic, socialist, revolutionary, feminist, ecological, libertarian forces world wide. We as internationalists in Rojava will contribute what we can to make this resistance a huge and glorious one. but all of us brought the same cause to Rojava: the hope and power that the revolution of Rojava gives to all people that are struggling for a better world. Since the beginning of this war internationalists have been fighting alongside YPG/YPJ for the victory of the revolution. We have defended Rojava against ISIS and Turkish Fascism and we are ready to defend all oppressed peoples of the Middle East and beyond! Sehid Namirin! Martyrs Never Die!